CBD Glass is your go-to spot when you are looking for an integrated sink. One of the greatest things about these sinks is that they are practical, because they allow you to wipe up any countertop mess right into the sink, making it easy to clean. Choosing a glass integrated sink is even better for many more reasons. One main reason is the fact that glass, as the sink material, is non porous, durable, and hygienic. There is nothing better than an easy clean up, especially in a bathroom. Water spills, make up dust, hair, etc. are all things that you deal with when cleaning your bathroom. Having your entire sink and countertop as one, non porous material, makes it extremely easy to clean and maintain. Another great benefit to this CBD Glass product is the variety of color choices. As you can see in the pictures below, there is a great amount of choices when it comes to customizing your integrated glass sink. For colors, we offer any one of CBD colors, or any color from a Benjamin Moore color chart, translucent colors, opaque colors, as well as rusty colors. You can find all of these choices on our “Resources” page, under “Glass Colors”. If you wish, you can also add a texture to your integrated sink to make it more interesting and unique. 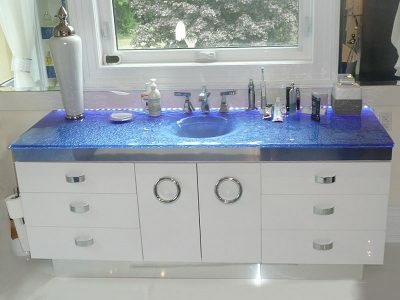 For example, using a “Melting Ice” texture on your sink, with any blue/aqua color, will give it a “water” look and feel. 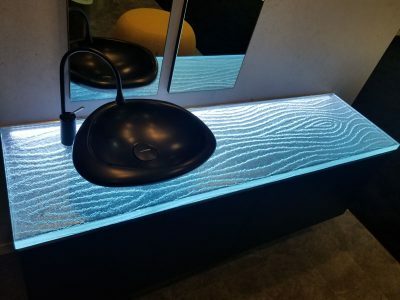 Last, but not least, you can customize the shape of your glass sink. 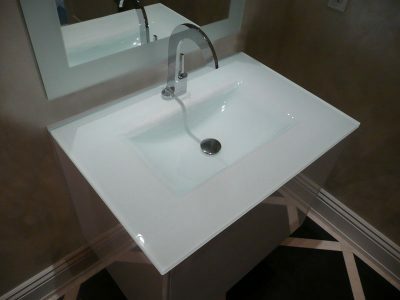 For example, our gorgeous, one-of-a-kind “Waterfall” sink. It comes in a variety of sizes, so you can choose whatever fits better in your bathroom. 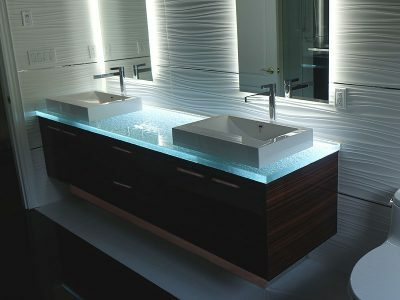 As you can see by our pictures, you can either use one long “waterfall” glass sink, or have two smaller ones, side by side. In order to complete your bathroom, you of course need a sink; and in most cases, a vanity. 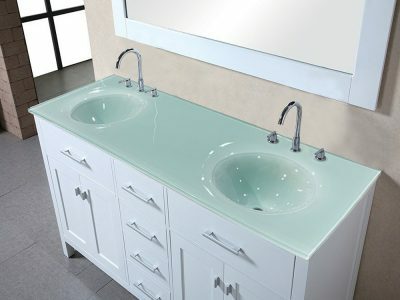 Here, at CBD Glass, we offer a unique variety of vanities. 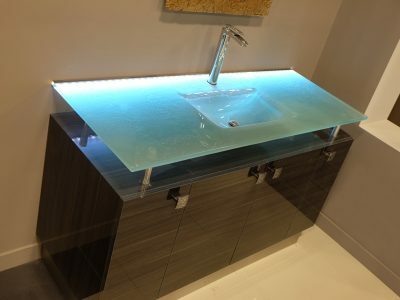 If you like one of our glass vessels, but do not want to go to another place to buy a vanity, we will be more than happy to assist you with both. Or even if you have a sink you love, but want a new vanity, we can help you with that as well. Our vanities are all custom made, from top to bottom. You can have it made from glass, wood, melamine, etc. 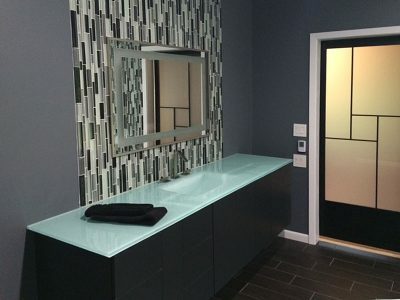 Paired with one of our glass countertops or integrated sinks, you will not be disappointed at the final result. Please contact us with your preferred design and we can help you create it.